Business Magic Lesson #6: Pressure is not an abstract feeling of gloom or just general pessimism. In most games of Magic, the state of the game can be understood in terms of problems and solutions. An adverse situation is a problem which calls for a certain solution. This means a card that, hopefully, is somewhere in your deck. Can you draw that card in time? And if you do, are you able to play it? If you play it, what are its costs and benefits? Pressure is, at its core, about elbow room. Do you know a failsafe solution to your current problems? Great. But can you really implement it? 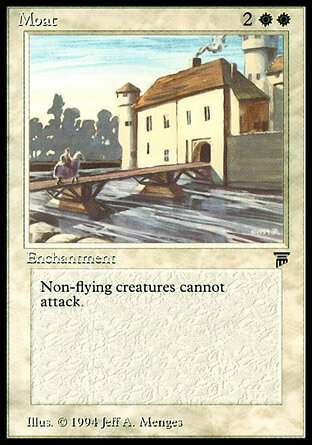 Here’s a good example for a failsafe solution: Moat, a classic Magic card, is a defensive staple against aggressive strategies. Playing it often effectively shuts down your opponent’s offensive. On the flipside, you may very well lose a game with a Moat you cannot play in hand. In this case, you might have needed a little more time, or cards, or mana. Or, in economic terms, a better cash flow. Or a loan. If you have identified a solution to your problem, but cannot implement it due to external constraints, then these conditions have put you under pressure. The good news is that the things that exert pressure are actually quantifiable. The logical consequence is that pressure itself must be as well, then. Business Magic Lesson #7: Pressure is a tangible, measurable restriction on your freedom to act. Understanding where pressure comes from is crucial. Pressure is not a loan coming due, or non-flying creatures attacking you. Pressure comes from a your lack of options concerning these problems. If you can keep borrowing on reasonable terms, or play a Moat, you’re actually under no pressure at all. But if you can’t, the pressure is actually exerted by unfavourable lending conditions or a lack of mana. You’d do well to quantify these factors. Identifying possible pressure sources and quantifying their impact on your decision-making makes sure you always know how much elbow room you really have. You can then lay out your solutions portfolio accordingly. I recently had the opportunity to hear Garry Honey, of Chiron Risk, speak about risk management at Cool Logistics Global. Most companies’ risk management, Honey argued, just plain misses the point, because they do not quantify their risk sufficiently. Pointing out that a risk exists covers your bases (and puts you in a great position to shift blame afterwards), but does not actually help you do anything. What is more important is associating it to probabilities, costs and consequences. Only then can you act on real information. The same applies to pressure. If pressure is just an abstract force, it will get to you. If you quantify it and review your options, it will become just another thing to manage. Don’t use pressure as an excuse at the gaming table or in your work e-mails. Look for the factors causing it, and quantify them. Only then do you have a chance to lower the pressure before it crushes you.